I recently met up with a good friend, Frank, who's been in the jewelry business for many years. 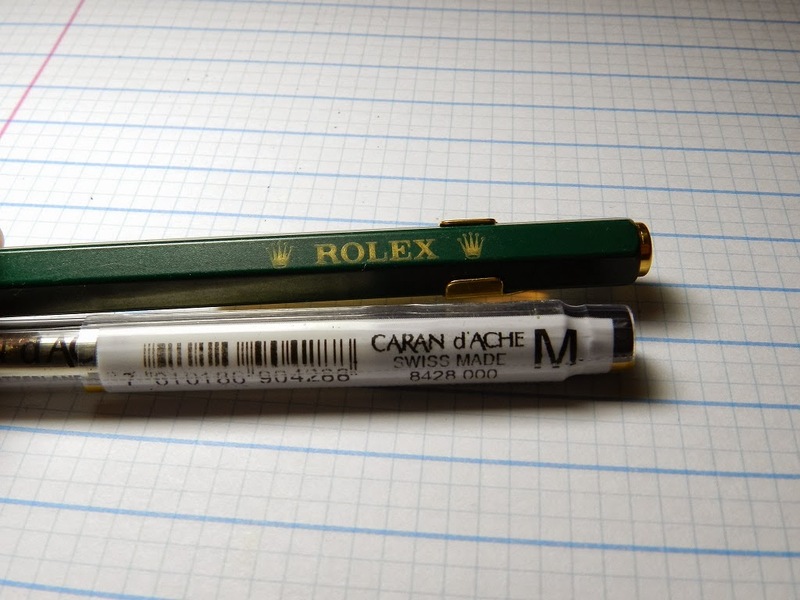 An item he recently shared with me over some fine ale was this Caran d'Ache ballpoint, with a brand from arguably the most well-known fine watchmaker, Rolex. The green and gold is reminds me a bit of the 80s, an item you might expect to see in the first Wall Street movie- I dig it. My friend handed me the pen, lamenting that the refill was empty. So the search began to find the replacement. I was fairly certain it was either the Schmidt 9000 ballpoint or another one I had heard of called the 'Goliath'. A quick search revealed that it was the Goliath that I needed, so I ordered one from The Largest Online Retailer and had it in a few days. The refill was pricey, but it is also made in Switzerland, comes in a sturdy protective tube, and would likely last long enough to belt out a solid 200 page novel. It's called the Goliath for a reason - it's a damn big refill. Writing with the pen was quite pleasant. I'd happily carry this pen as an every day writer. 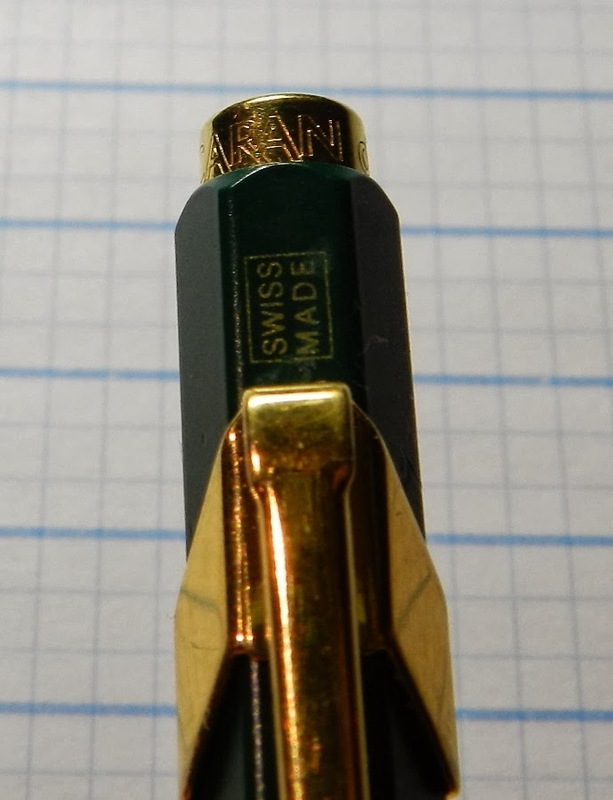 Sure, it's not the uber-dark super ballpoint ink that's out there now, but it's a worthy ink, and I, at times, enjoy the less-than-perfect ballpoints out there; the static on vinyl recordings or cassette tapes that you listened to 20+ years ago have this quality, and there's something nice about that. 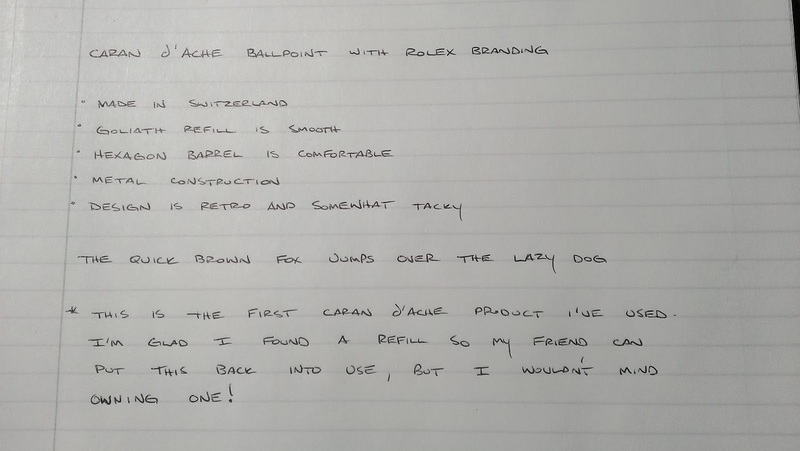 This was my first experience with a Caran d'Ache product, and I often want a Caran d'Ache pencil when I see them over at one of my favorite blogs, La Vie Graphite, run by pencil friend Speculator. I think I might have to seek out a pen/pencil combo from this fine Swiss manufacturer. My friend recently informed me that the pen is a frequent user in his daily arsenal, so my job is done. It'd be a shame to have this workhorse sitting in a drawer. The build quality is solid; so long as you find refills, this thing will last forever. I did not hear from Hester, so a new winner is being chosen. Congratulations, Wade! You have one week to e-mail me your address before a new winner is selected. Every now and again I get the urge to pick up a regular ol' wooden pencil, and I've heard great things about Tombow's pencil quality. A few things led be me to believe this was going to be a favorable experience. 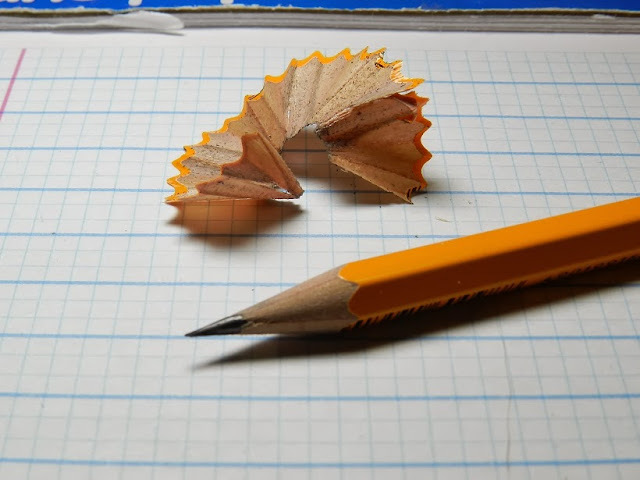 First, the coating of the pencil is thick and smooth, not like those shoddy pencils you often find during Back to School, what with all the flaking what such. Plus, it say 'High Quality' right on the side, so at least there's some rhetoric in the works, too. 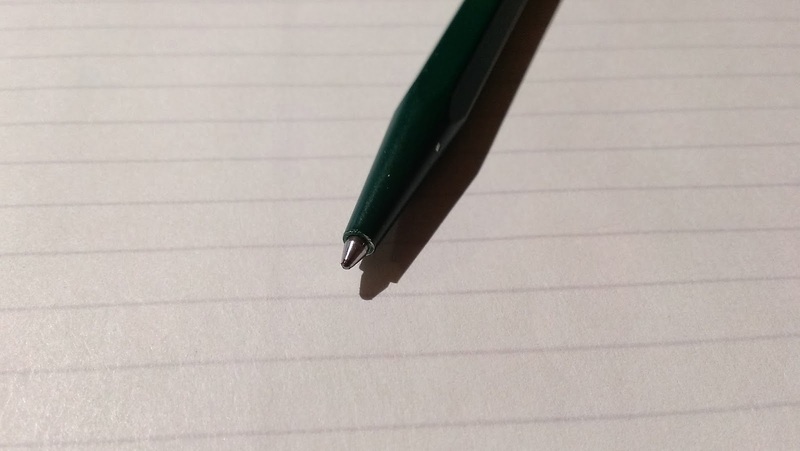 I do prefer darker lines when I write, since I'm typically a pen user, so I like that this one is a 'B'. Tombow has also been making pencils for century, so I figure that counts for something. I find it amusing that this is FOR GENERAL WRITING. I wonder if worlds collide if I try to use it for sketching or as a chopstick. Everything else is standard. Basic metal ferrule and a pink, squishy eraser. Sharpening was ideal; the wood peeled smoothly, and the cedar smells exceptional. The point was smooth and did not break or crumble during sharpening. This image is a bit fuzzy, darn. I compared the Tombow with some other great pencils, and I was surprised to see how well it fared against the Staedtler Noris, which was a bit smoother due to a waxier feel. The General's has a lot of tooth and is very dark, while the Tombow has a touch of tooth and is perfectly dark. This is a soft lead, so you will likely have to resharpen the point fairly often. I was actually quite disappointed with the Faber-Castell 9000 as it seems to be more of an 'H' in hardness, so I don't know what's going on there. Last step was the eraser test. The pink eraser works about as well as expected. It's a bit less abrasive than some, so it doesn't shred the paper, but it's very soft, so it's not going to last very long. Overall, I do like this pencil quite a bit. 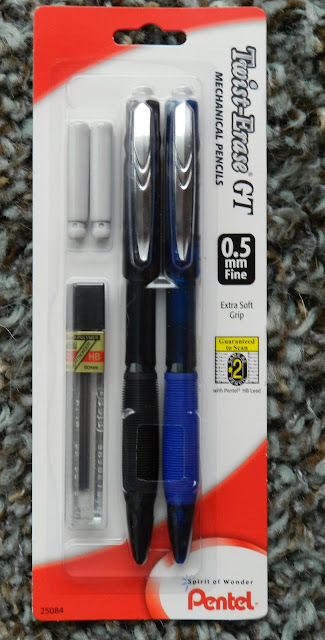 It may be on the pricey side for a basic pencil, but the lead is excellent, and there's a lot of things done well in this package. I received my pencil, no charge, as a sample to review from JetPens. Congratulations to Hester! You'll have one week to e-mail your address before a new winner is selected. Many thanks to everyone else who entered. I have other supplies ready to send out, so stay tuned for more reviews and giveaways! Pentel has a wide range of products, even within their mechanical pencil line. Shown above are variations of the Twist-Erase model. I recently reviewed the Twist-Erase Click .9 mm Orange, which I love even more now than when I first tried it, so I was excited to put these to the test. Jumbo eraser is no joke - this is by no means an emergency eraser. The eraser can be a bit finicky in that the act of eraser causes the twist mechanism to retract or extend the eraser, depending on which direction you're erasing in. This can be minimized with a firm grip. The erasing quality was pretty good (yes, I should have done a sample, but I didn't) - the marks are almost completely gone, but the eraser is not quite as good as, say, a Staedtler Mars Plastic. They are, however, readily available at most big box stores, so that's a huge plus. The barrel is very featherweight, though everything feels sturdy and ready for work. The clip, grip, and clicky-lead-dispensing-mechanism-thing, though utilitarian, are satisfactory. I do wish the lead sleeve was retractable/pocket safe, I may be in the margins on that one, and price is always a factor. Final verdict is that these are totally decent, and I think most people would enjoy using them. 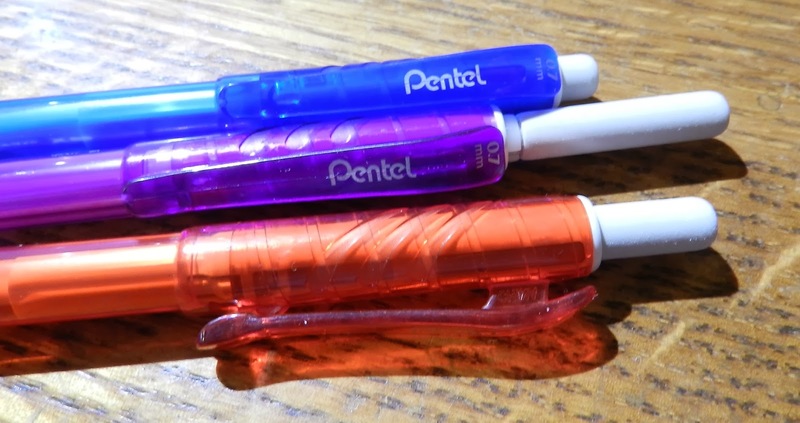 The colors might not meet everyone's tastes, but fortunately Pentel also makes the same pencil as the Twist-Erase Express, with colors in the 'Office Color Collection'. See below. Same pencil, just a more mature, more professional look. You'll notice extra leads, an eraser, and four pencils instead of three. This pack is great because it's enough to get someone through a semester or many days at the office. Again, if you don't mind a lightweight plastic format, then these will probably meet your needs quite well. Next up is the Twist-Erase GT. This variation comes with a metal clip, and a rubbery-comb style grip that is squishy, and has a fair amount of give to it. 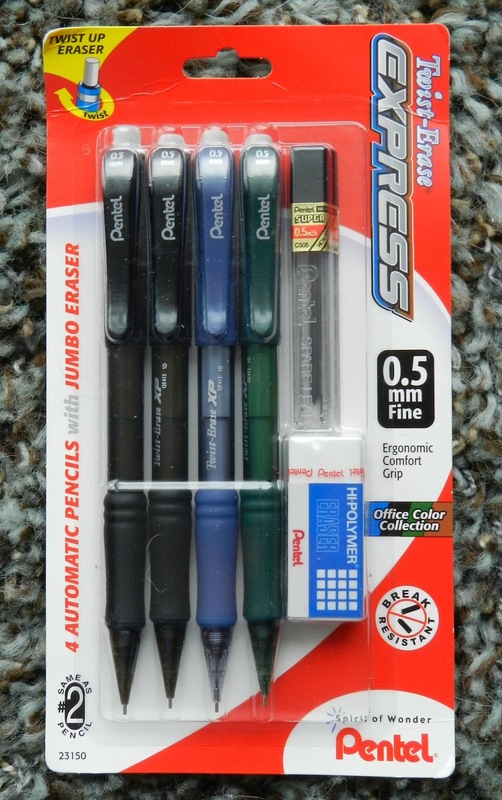 These do have a larger (than emergency size) eraser, but they are not the jumbo size, so you will have to account for a different refill if you plan on acquiring multiple Twist-Erase pencils. Well, it's not just the materials that attract dust; our humidifier was out the week that I took these pictures, so it was uber-staticky around the house. At any rate, you can see the comb-style grip, and the whole package looks a bit 80s perhaps - a bit retro - and I have no problem with that. I promise that I dust my house - I really do. Lastly, we have what appears to be a regular Twist-Erase. 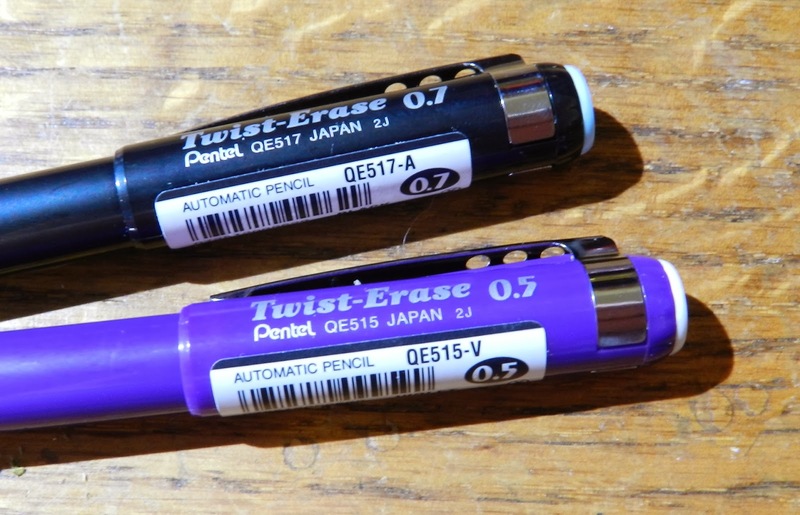 When I search for the model number of QE515 or QE517, I find the name Twist-Erase III, which is not indicated on the barrel, so I guess this is just another revision? Of the variations I tried, I think this one was the most regular of the bunch. 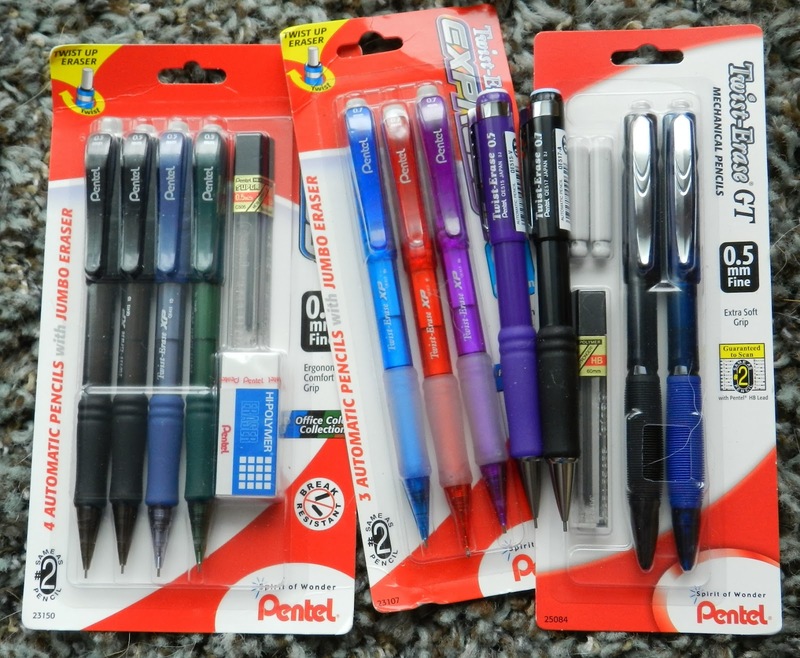 You get a mechanical pencil with a thicker barrel, a metal clip, and a semi-squishy grip. It will get the job done, but there are no real frills beyond the jumbo eraser. 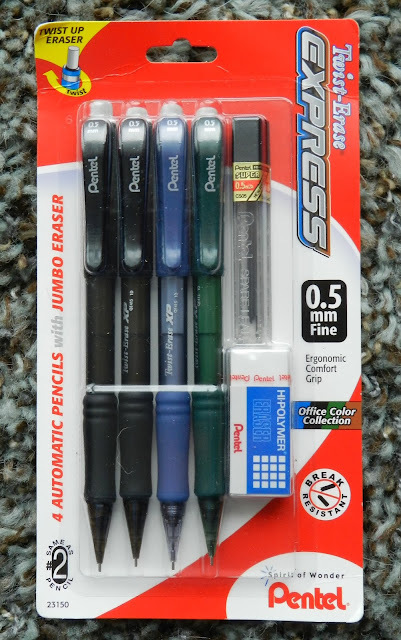 The bottom line is that if you like lightweight mechanical pencils, and you like an integrated eraser, then there's probably a Twist-Erase model out there for you.